Cassandra Winona's Page - 30 Bananas a Day! Fructose malabsorption? - depressed and stressed. Anti-depressants for eating disorder, need advice to help someone please? How much difference does calorie intake make to healing? AAAAAHHHHHH! Solve the Obesity Epidemic by Tricking Brain Out of Eating Sugar????????? "Nice to meet you too!" "<p>Hi, nice to meet you, thanks for the add! :) "
"<p>I would only recommend that as a back up plan. There is a huge difference between cooked and raw. I would first try to up your calories, you're no way eating enough and I know that effects my body temperature. " "<p>+1, when I don't get enough fruit calories in my body temperature drops, dramatically. Between 2000 and 2500 is not enough. I eat between 2500 and 3000, usually 3000, and if I don't my temp drops." Cassandra Winona replied to Christina Bolton's discussion Is Salt really that bad? "<p>I don't think that's false, from what I've read that makes total sense, just because YOU don't get those cravings. We know for a fact that organic fruit and veg are higher in natural mineral content." "No problem :) yup, in Kent"
"<p>Hi, thanks for the add. You like Mr. Scruff, cool?! :)"
"<p>hi there, thanks for the add, I see you're an English girl, cool. :) "
Cassandra Winona replied to DURIANRIDER's discussion What about wee wees and poo poo's? Dont you feel guilty for having to go 'again'? "<p>Although obviously I wasn't backed up for literally 8 years, that really would be bad! ;)"
"<p>lol, that is so true, can't believe how bad other peoples crap smells now, mine seriously hardly smells at all and there's no after smell! I used to always be constipated, it was a problem for me for about 8 years, not any more. :)"
"Thanks for the friend request :-) Certainly happy to accept." Cassandra Winona replied to Sara Dunham's discussion Keep breaking out :(. Help? "<p>Totally agree, dump the cashews, they seriously make my skin break out, all nuts do. I have extremely sensitive skin even on 80-10-10 and have had to meticulously work out the foods that make me break out, these include dates, nuts in…"
I became HCRV about 5 months ago after refining my diet from high raw. I came to it after suffering health problems since my teen years, eating disorders, chronic fatigue, interstitial cystitis,excess weight, depression, acne etc which didn't improve with other dietary change, including the standard vegan diet. I was a vegetarian for many years for ethical reasons but had very poor health. I put this down to candida so I hardly ever ate fruit. I became more and more of a raw foodist but still had many health problems. Then I came to Doug Graham and the 8-1-1 diet which convinced me to try fruit again. So I changed my diet to high fruit, low fat and couldn't believe the results. After 25 years my health problems have gone or are healing! I can't express how amazing it is to be able to eat as much fruit as I like. Not only do I love it but I can live the ethical lifestyle I believe in. My passions are art, music, film, anything creative, philosophy, spirituality and the human condition. I was born with Aspergers syndrome, but that's a whole other story. I live in a small town in England with no vegan friends. My life, health and spirituality have gone through something of a transformation this last year, and this is where it has brought me. I'm excited to be here. I love my kids, art, reading about nutrition, Indie music, film, going for long walks in the outdoors, mother nature, anything handmade, beautiful and individual. Could not live without music, love, love, love it, but I am an artist at heart, with the intention of using my art to promote a plant based lifestyle. I have gone from a high raw diet to a nearly 100% raw high carb vegan diet. I am eating more and more fruit everyday. I have absolutely no doubt that it is the food that my body instinctively wants to eat. It's great to be apart of a community like this. Thanks for the friend request :-) Certainly happy to accept. Hey Cassandra, yeah you're right Lincoln is nice (Skegness was a joke really, it's not the most amazing place known to man!). I got in contact with Sean regarding meeting up and he has his exams coming up in the middle of May so said for him it's a difficult time, so it'll just be the two of us. I'm looking forward to the meeting! When I'm in Lincoln, (don't know if I told you, it'll be around the 21st May onwards) I will send you a message. 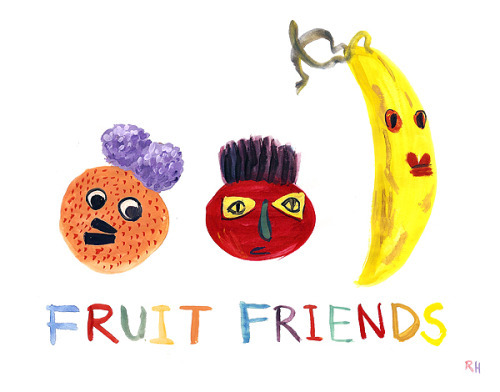 Happy fruit eating, wish I was doing more, you're fruit basket photo looks so colourful and tasty! Excellent Cassandra! :) I'm glad! Hey Cassandra, yeah it's so great to have the opportunity to meet others with similar lifestyles that others think are insane! Although, I'm not in lincoln yet, can't remember if I messaged you that I'm in France at the moment. But I will be back in Lincoln on the 21st of May for 2 weeks so if you have some free time during then, that would be so great. Also, further good news for you.. there's another guy on here- Sean Kelley, really friendly who's studying at Notts uni and we're planning to meet up during May, so maybe the 3 of us can get together. I suggested to him Lincoln, I know it's not the best place in the world but it appears to be smack bang in between you and him. But open to other suggestions... skeg! ?